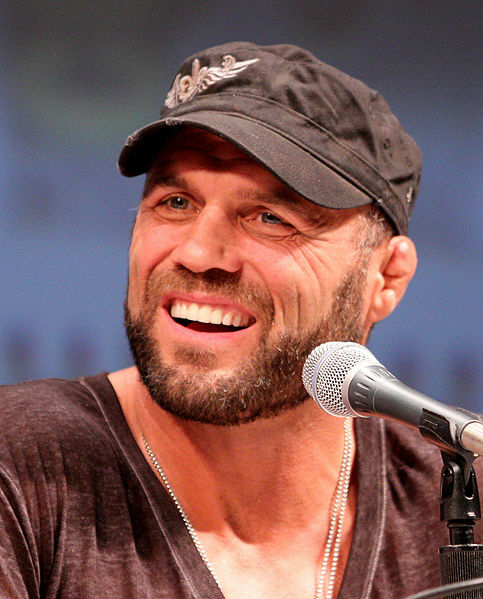 Randy Couture has expressed his support of testosterone replacement therapy (TRT) for athletes participating in mixed-martial arts (MMA) competition in an interview with Steph Daniels for the ‘Bloody Elbow’ website. The use of TRT in MMA has caused considerable controversy. After all, testosterone is an anabolic steroid and steroids are banned in most sports due to their well-established muscle-building and performance-enhancing effects. Several MMA athletes have admitted using testosterone as part of a medically-supervised treatment for hypogonadism. Some people in the industry, such as UFC President Dana White and Phil “New York Badass” Baroni support the use of TRT in MMA. But others, such as UFC middleweight Michael Bisping, see it as an excuse to use performance-enhancing steroids or to compensate for the suppression of their own natural testosterone production due to the previous use of illegal anabolic steroids (i.e. anabolic steroid induced hypogonadism [ASIH]). Randy Couture joins the former group and defends TRT for the sport of MMA. Furthermore, Couture doesn’t believe that an MMA fighter’s low blood testosterone levels (hypogonadism) are necessarily indicative of the previous use of banned anabolic steroids (ASIH). While Couture supports the use of TRT, he admits that TRT has its drawbacks. Couture recognizes that TRT is usually a life-long therapy. Once TRT is administered, as is the case with all anabolic-androgenic steroids, the body suppresses its own endogenous (natural) production of testosterone. Because of the suppression, Couture recommends alternative treatments for hypogonadism. Conveniently for Couture, his supplement company, Xtreme Couture Athletic Pharmaceuticals (XCAP), just happens to market dietary supplement that can be used instead of TRT. XCAP products supposedly help support and rejuvenate endocrine “glands”. Putting the issue of TRT and the shameless plug for his supplement company aside, Couture claims that he was never troubled by the illegal use of steroids in MMA. If he suspected an opponent used steroids, he ironically saw it as a competitive advantage.